It’s officially spring which means that warm weather makeup is returning, and one of the first to hit shelves if none other than Fenty Beauty’s Trophy Wife Body Lava. Yes, you did read that correctly. The glow-inducing body product is back and in a new shade. On Wednesday, March 20, Rihanna took to her Instagram to announce the return of last spring and summer’s biggest glowy product, Body Lava, but she didn’t just announce the return. She also let Fenty Beauty fans know that Body Lava would be returning in a whole new shade, and it’s an icon. The new Body Lava is a recreation of the brand’s Trophy Wife highlighter. The vibrant, true gold pressed powder highlighter has been a favorite among Fenty fans, and it was even chosen (presumably by Rihanna herself) to be recreated in special packaging for RiRi’s 30th birthday. Now, the shade has been transformed once again, but this time it’s into its very own Body Lava shade. If you basically just lost it thinking about bathing in liquid gold all spring and summer, there’s good and bad news. The good news is that the product became available March 20 at midnight pt, so you can snag it right now. The bad news? Fenty Beauty’s Trophy Wife Body Lava is limited edition. The limited edition nature of the product, however, is also why the relaunch is such a huge deal. Body Lava was one of 2018’s biggest beauty launches, at least when it comes to internet fame. Why? Well, mostly because of Rihanna herself. In 2018, when Body Lava first came on the scene, the Fenty Beauty creator took to her Instagram to showcase how to apply the product onto her shoulder with the brand’s kabuki brush. The video of her applying Body Lava went viral, and soon, people were recreating the video online under the hashtag #RihannaChallenge. Apparently, Body Lava was a hit with shoppers as well. 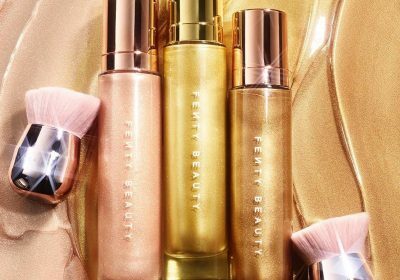 The latest return of the product and introduction of a new shade isn’t the first time that Fenty Beauty has brought back the glowy product. Back in Nov. 2018, the brand launched limited edition sets for the holidays that included the two original shades Who Needs Clothes and Brown Sugar. Those sets eventually sold out, and Body Lava hasn’t been seen since, until now. If the new Body Lava in Trophy Wife sounds like a must-have or if you’ve been missing the two OG shades, now is the time to get to shopping. Body Lava is available both in stores and online at Sephora, on the Fenty Beauty website, and at Harvey Nichols in the UK. The only downside to Body Lava’s return is that the product is limited edition. If you want to keep your Rihanna-inspired glow going all spring and summer long, you may want to think about buying Body Lava in bulk. There’s no telling when or even if the body glow goodie will be coming back into stock, and let’s be honest, everyone wants to glow like Rihanna for as long as possible.